After a whirlwind week of travel and fun, I have returned to the land of Ubar with more knowledge and lots to share about my experience at the 122nd Annual Session of the Supreme Council of the Grottoes of North America. The event was held at the Omni Champions Gate Resort in Orlando, FL. It was a fabulous hotel with lots of amenities, including a lazy river which I indulged in on more than one occasion. While I was able to relax and enjoy a bit of the Florida weather, I was there to represent Ubar Grotto and to learn more about how our organization runs on a national level. 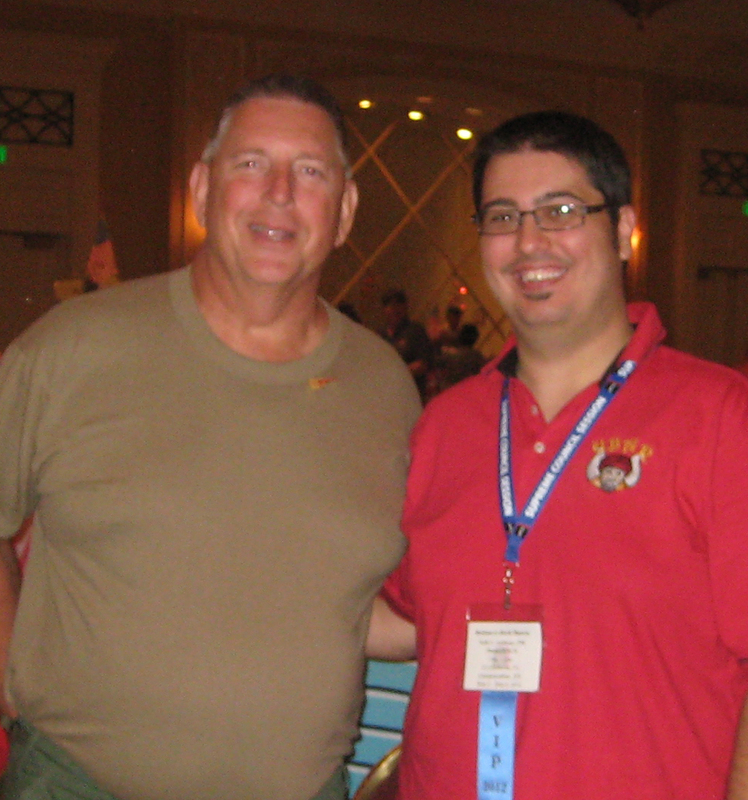 The Monarch with Jim Janargin, Secretary of Cinema Grotto. Let me be the first to say, that almost everyone I met truly displayed the qualities of Sympathy and Good Fellowship that are taught in Grotto. I met Prophets from all over the Realm – true cajuns from Ka-Jon Grotto, located in Houma, LA; good ‘ol boys from Chinar Grotto in Houston, TX; the party animals from Ibn-Saud Grotto in Kokomo, IN; and of course the Secretary of our rival Grotto, Cinema in California. It was an amazing chance to understand and reflect on how other Grottoes from around the country apply the teachings of our organization. Ubar had two pieces of legislation / business that needed to be approved. The first was a by-laws change allowing Ubar to meet on the 4th Sunday instead of the 2nd, which was approved by the Jurisprudence Committee without a question. The second piece was the “No Prophet Left Behind Act,” which outlines a procedure for allowing Master Masons to join a Grotto other than the one which has jurisdiction over their area. This piece of legislation was presented and voted on, being approved with zero opposition! The big thing on the agenda was the election of officers. No less than five men ran for the office of Grand Captain of the Guard, which is the bottom of the progressive line that eventually leads to Grand Monarch. The race ended up coming down to two candidates – Pro. Jim Drake of Amrou Grotto, which meets in Zanesville, OH, and Pro. Mike Hossler, of Ibn Saud Grotto in Kokomo, IN. After a tight race, Pro. Hossler won the election to become the newest officer. The office of Grand Trustee was also up for grabs, being contended for by Pro. David Chambers of Achbar Grotto in Columbus, OH, and a Prophet Abbas Grotto in East Peoria, IL. Pro. David Chambers was endorsed by Ubar Grotto going into the election, but sadly lost by 8 votes. It was close call and we congratulate Dave on a good campaign. 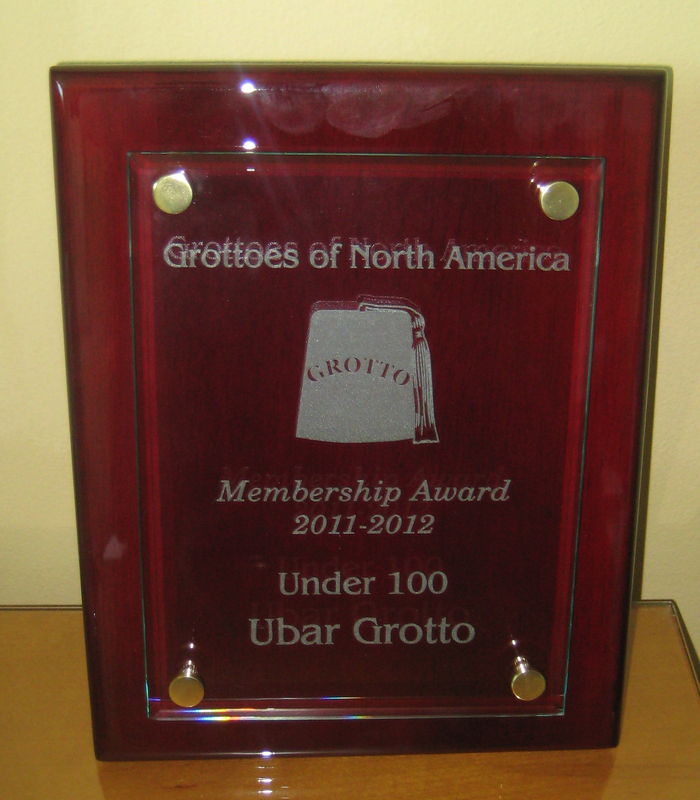 For Ubar Grotto, the best news came amid the elections, when the membership awards were handed out. Ubar won for the most new members for a Grotto under 100. The best part is that the contest ended before we had the chance to take in our latest batch of members, giving us a great head start on getting the same award again next year! Congratulations also go out to Pro. Tracy Bitner who earned a Ruby Membership key for recruiting five new members during the last year. 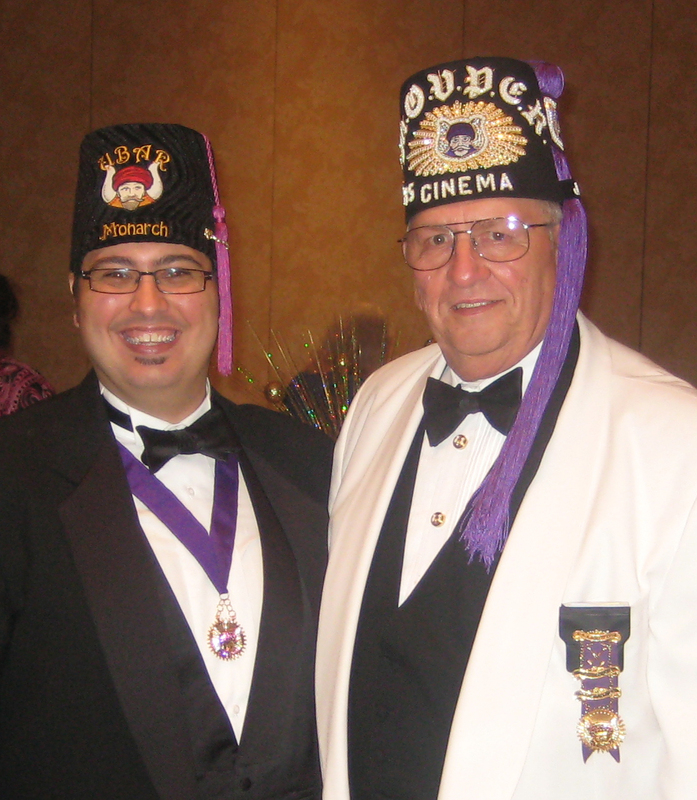 I also got a chance to meet with several of the Grand Line officers, including our new Grand Monarch, Pro. David Rebmann, also of Abbas Grotto. Pro. Dave is an upstanding guy and I’m sure he’ll do a great job leading the Realm during this next year. I also got a chance to speak to each of the other Grand Line offices and discuss our Grotto. They were all very supportive of our program and our membership growth and wanted me to bring their thanks back to our Prophets. A highlight of the event was the Humanitarian Foundation Program that was held. The information provided was fantastic and several special needs children who had benefited from the Foundation were in attendance. It is easy to see just how influential our charity can be in the lives of those who need it and I have a new found zeal for the Humanitarian Foundation and its endeavors. Our Monarch along with Pro. David Rebmann, the new Grand Monarch. While the event was a lot of work, there was also plenty of play. With several hospitality suites, the Red Tassel Party, and many good meals, everyone had a great time being with their friends from around the Realm, both old and new. It’s hard to cram four days worth of Convention into an article, so you’ll just have to talk to me in person to get more of the details. I brought back lots of registration forms and materials for Grotto Association meetings and for the Supreme Council Session 2013, to be held in Nashville, TN. Thanks again to everyone who made my Supreme Council experience a good one!